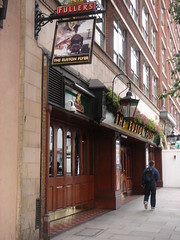 Fuller's pub between Euston and St Pancras stations. Guest beers, and food served noon-9pm every day, according to the Good Beer Guide. Opening hours and food times taken from Fuller's website, May 2008. Last edited 2013-09-12 22:45:42 (version 15; diff). List all versions. Page last edited 2013-09-12 22:45:42 (version 15).